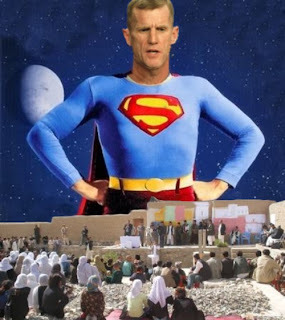 On Weekend Edition Sunday, Lynn Neary, speaking to NPR's Tom Bowman about the possibility of more US troops being sent to Afghanistan, asks, "Will General McChrystal be asking for more troops?" "The big effort he's making is protecting the population and to do that you need more troops." And this passes for journalism? Bowman is essentially admitting that the AfPak misadventure is a protection racket. It's like god saying to Abraham, "We gwine protec u, 'slong as u givup u first born." It's extortion, or exaction: the crime squeezing pipelines from a country through preemptive war*. *preemptive war is terrorism, so to say we're there to root out terrorists is sort of ipso facto excusifying. Welcome to rationalizations for a quagmire that you can believe in. But how are we going to protect them from our missiles and our bombs? Or who's going to protect them from their protectors? Or who's going to protect them from their protectors?